Push alerts offer a highly personal yet fragile relationship with audiences. They must be timely and informative or users will opt out. News organizations don’t need to wait for readers to seek out their journalism online or stumble across it on social media. By spreading the news on lockscreens, publishers can reach audiences at any time and build personal relationships with them. It’s an ideal platform for experimentation given the potential for high-impact results with relatively minimal effort. But before exploring the practices of push alerts, it’s important to understand why they must be mindfully prepared and distributed. When consumers are not engaged with a publication, they are busy with other things—working, eating dinner with friends, taking care of their children, sleeping. The publisher is interrupting consumers with news that they might not want to know, at least not at that moment. If a publisher is going to interrupt the user, the content needs to be worthwhile. Otherwise, frustrated users may opt out of alerts or uninstall apps altogether. Here’s an example of a poorly conceived push alert from The New York Times. Kahuna, a marketing software company that provides a push notification service, has identified three key elements to crafting an effective push: timing, copy, and user segmentation. Push alerts sent with their optimized timing feature perform 384 percent better than the ones that aren’t, the company found. For example, being aware of different time zones or deciding that a non-urgent push can be sent at 1 p.m. instead of 6 a.m. can better serve the user. Even if the news is important and the user is likely to want to know it, an alert still might not be the best way to deliver it. A post on social media, inclusion in a newsletter, or distinction in the app may be more appropriate. Good judgment is all it takes. 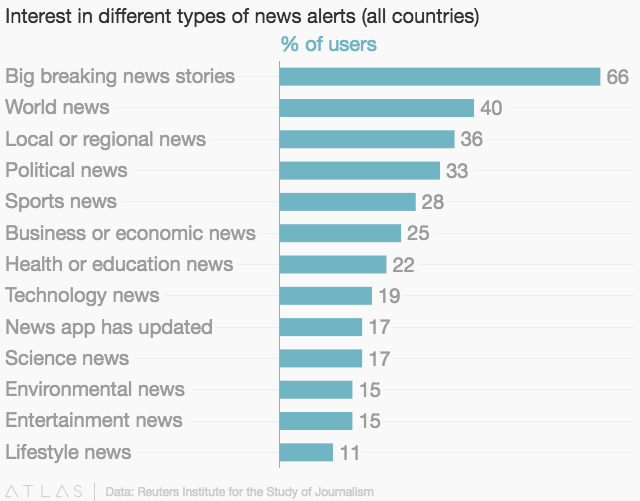 According to the Reuters Institute for the Study of Journalism, only one third of smartphone users in the United States enable push alerts. Those that don’t receive them are purposefully avoiding them. More control over what they are receiving would change the opinions of many. Tone and style will vary across publications, but a good rule of thumb from Kahuna is to keep copy clear, concise, and compelling. The push should be short, but adding some context to the news makes it much more valuable than a restated headline. With the latest operating systems, copy can go well beyond text. Mic is taking full advantage of these advances by adding video that can be watched within the alert via 3D touch. User segmentation, or personalization, means sending alerts only to certain users determined by topics pre-chosen by the user or by age, location, or previous viewing history. Apps are not required to send a push alert. A Chrome extension allows websites to send pushes on desktop and Android phones. Safari also has its own push services on desktop. On mobile, Apple News and chat platforms like Facebook Messenger and WhatsApp send alerts to consumers; however, the publisher loses control over how the push is sent as well as data on user interaction. Although click-through data and open rates give some indication of a push alert’s effectiveness, there is no single metric providing a holistic view of how well a strategy works. Some alerts are meant to stand alone as a piece of content, so click-through and open rates are an inefficient metric to analyze. Instead, it’s more telling to look at opt-out rates and uninstalls. If the alert promotes a call to action, like joining a livestream or reading a story, publishers can also track efficacy by how many actions the user completed after the push. News organizations can go deeper in experimenting with push alert innovations, such as further personalization using automation or dynamic deep linking — a strategy popular among commerce apps. The Guardian Mobile Innovation Lab has tried crowdsourcing and, ideally, some news organizations will figure out how to monetize alerts, providing not just timely and engaging news but also information users find indispensable to their daily lives. Developers can use one of the many APIs or push services available to send out alerts, such as Kahuna, Urban Airship, Parse, Amazon SNS and OneSignal. For a step-by-step guide to sending a push notification, visit this guide by UrbanAirship. We don’t look at notifications as an afterthought. We look at them as a story and a piece of content in themselves. It’s very powerful. It could become bigger than email. There’s no spam traps; it goes exactly to the people who signed up for it. You could move hundreds of thousands of people a day to a piece of content. Push notifications are one of the most fragile relationship news organizations have with readers. According to the Reuters Institute for the Study of Journalism, only one third of smartphone users in the United States enable push alerts. Those who don’t receive them are purposefully avoiding them. More control over what they are receiving would change the opinions of many. From “News Alerts and the Battle for the Lockscreen,” by Nic Newman for the Reuters Institute for the Study of Journalism. Breaking news is the most valued push notification. 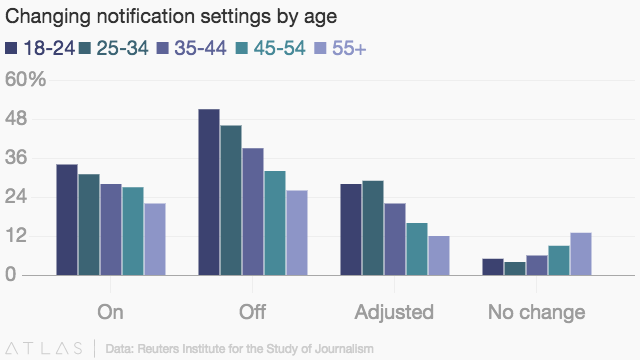 Certain people are more or less likely to navigate the settings in their phones. It’s important to know who you’re pushing to and the best way to deliver it. Featured photo by Jeshoots used under a Creative Commons license. Innovative use of push alerts opens up new ways to distribute content, gather information for reporting, and, potentially, generate revenue. Madeline Welsh is the associate editor at The Guardian Mobile Innovation Lab. The Guardian Mobile Innovation Lab is prioritizing push alerts in its digital strategy. Mic is a news organization that is centered around push alerts. BuzzFeed is viewed as a leader in push alerts. The percentage of people that visit the landing destination of a deep link. Hyperlinking to a specific location in an app or website other than the homepage. Personalizing the landing destination of a push alert to each user, although everyone has received the same copy. The percentage of people that open/view the push alert. Anissa earned her bachelor’s degree in journalism from Howard University in 2015. She is interested in the possibilities in distributing content with new media.